Spring is now here, and so it is the perfect time to make some carrot cake! I love carrot cake because you can add veggies to your dessert! 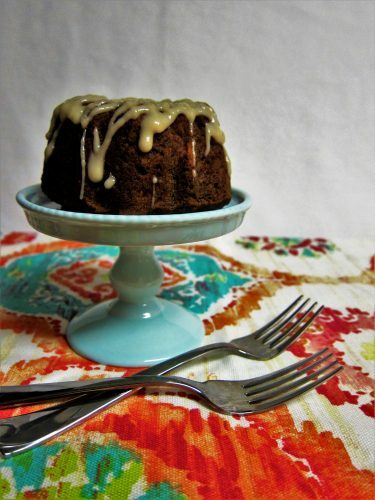 I have an easy healthier recipe for you that is super delicious and even portioned out, since it is baked in mini bundt cake pans. It happens to be gluten free, oil free, and fruit sweetened, but you would never know by tasting it because it tastes just as delicious as traditional carrot cake! If you don’t have mini bundt pans, you can use muffin tins instead, you will just end up with more muffins then you will bundt cakes. Oil 4 mini bundt pans (1 cup capacity). Whisk flour, baking powder, baking soda, sea salt, ginger, and cinnamon in a large bowl to blend well. Place dates, reserved water, oil, orange juice, and vanilla extract into a blender, and blend until smooth, then whisk this blended mixture into the flour mixture until well blended. Whisk in the cider vinegar until bubbles form. Mix in carrots. Transfer cake batter to prepared pans and bake cakes until tester inserted into center comes out clean, about 20 minutes. Cool cakes completely and un-mold. Whisk together the glaze ingredients until smooth, and drizzle over the cakes. Enjoy! Store any leftover cake in the refrigerator for up to 1 week.